The practice has persisted in spite of efforts by the then government of the Eastern Region, which in 1956 enacted a law abolishing the Osu caste system. The Osu caste system, an ancient practice across Igbo land which strongly bars any social interaction and marriage between the diala (free born) and osu (outcast) whose progenitors were believed to have been enslaved or dedicated to the deities of a community or village, has remained a vexatious traditional issue amongst Igbo. The practice has persisted in spite of spirited efforts by the then government of the defunct Eastern Region, which in 1956, enacted a law abolishing the Osu caste system. The osu/diala dichotomy is most pronounced in the area of marriage. The belief is that any ‘free born’ that marries an osu defiles the family. This usually leads to investigations by elders before any marriage is contracted between two families, especially when from different communities. One Igbo community where the caste system flourished was Irete in Owerri West Local Government Area of Imo State. But all that ended on July 14, as the traditional institution and indigenes of the community, in a grand ceremony, unanimously abolished the obnoxious system which they said had caused disaffection and ill-feelings amongst them. The traditional ruler, Eze Ethelbert Ekwelibe who made the pronouncement during the annual “Nta” (hunting) cultural festival held at the community primary school said as the chief custodian of the culture and tradition of his people, he decided to abolish the caste system because it was inhuman, ungodly and satanic. “I know that the issue of the Osu caste system has been with us since time immemorial, which I think should not have been in the first instance as it has created two classes of people within the Igbo society where some are considered as free born (nwadiala) and others as osu (outcast) who should not intermingle socially and even in marriage. “Therefore, the decision to do away with the caste system was done after due consultations with clan heads, traditional institutions and the indigenes of the community who overwhelmingly supported the abolition of this discriminatory practice in our community. 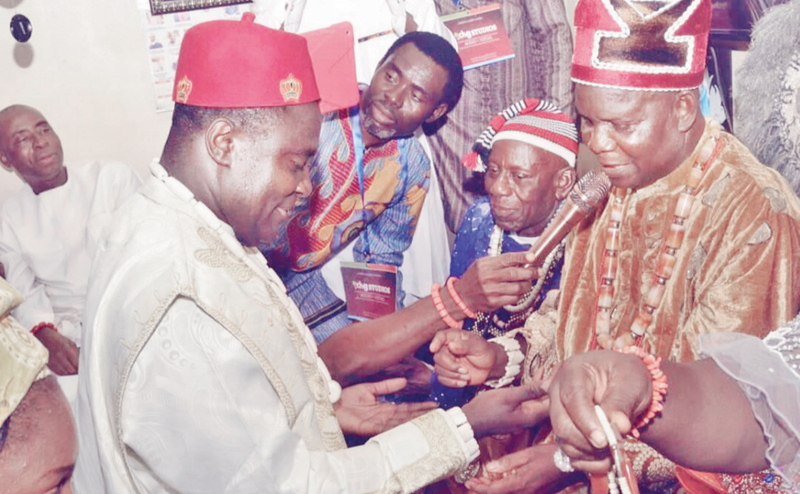 “So, today customary laws of Irete community have abolished Osu caste practices and we have chosen to do it during the ‘Nta’ ancient cultural festival of the people,” he declared. The occasion was preceded by a liberation Mass presided over by the Catholic Archbishop of Owerri, Anthony Obinna represented by Rev. Father Patrick Igbeole, at the St. Emanuel Catholic Church, Irete. 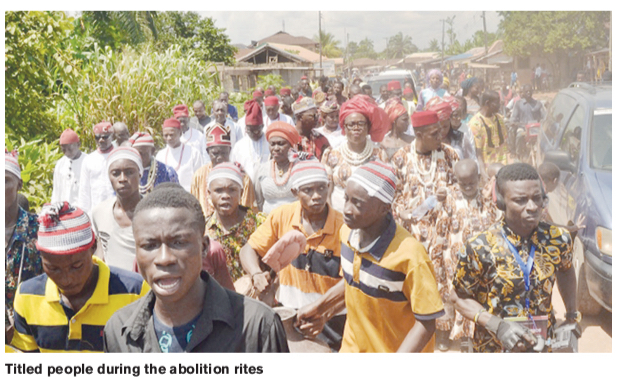 The priest expressed regret that such dehumanising treatment of fellow indigenes was still being practised in the state and urged the people to embrace the teachings of Christ and eschew all manner of injustice in their lives. “If you know you are holding anybody down in the name of whatever belief that is not godly, please, release such person and let them be free,” he advised. The cleric who linked the archaic practice to ignorance on the part of their forefathers, after his liberation urged both osu and diala to henceforth see themselves as one. “Don’t be afraid of the outcome of marrying an osu, only be afraid of Christ, when you come to the altar. I administer the sacrament of holy communion with the same cup for everybody, if that is the case, then all of you are now osu after eating from the same cup,” he counselled. Highlight of the occasion was a communal feast at Irete Primary School premises as well as conferment of chieftaincy title on both former outcast and freeborn from the community. A victim of the caste system, Isaac Ugorji expressed happiness that at last he has been accepted by his people. “You can’t imagine the pains I had gone through; when I wanted to get married, girls refused to marry me. They said I was an osu. Back in school those days, my friends could not associate with me because of the osu thing, but thank God today, Irete has redressed that by saying we are all one”, Ugorji stated with elation. To a prominent indigene, Chris Anukam, the caste system was an infringement on the fundamental rights of the people to freedom of association and even the pursuit of personal happiness. A cabinet chief of the community, Chief Cyprian Amako, the abolishment marked a new beginning in the community. “Irete community as a people realised that there is need to take action. Human beings should not be subjected to slavery based on societal class. We should fight for the eradication of evil practices and restore joy and dignity to the lives of those trapped by traditions. “This is the greatest legacy ever handed to us; we cannot continue to tolerate this; we thank our monarch for his wisdom”, Amako said. Yet, the brain behind the historic event, Eze Ekwelibe while narrating how he conceived the idea disclosed that it all began in 2009, four years before he was enthroned as a monarch. According to him, it began when he publicly stopped an osu from the community from breaking kolanut and pouring libation in the midst of freeborn at a certain gathering. “The man felt pain and said to me, these are supposed to be the Christians. His few words were direct and understandable; I was never myself after then. I prayed to God to give me the opportunity to stop this practice, and when I was chosen by my people in 2013 to be their monarch, I wrote to the 18 villages in the community about my proposal and nobody was against it, so I quickly initiated it and today you are witnessing the history. To God be the glory,” he said. All Progressives Grand Alliance (APGA) governorship aspirant in the state, Chief Uche Onyeaguocha, who witnessed the momentous occasion expressed elation, vowing that abolishment of the Osu caste system will be the first law he would push to the State House of Assembly if by God’s grace he emerged governor next year.